In the 1970s, the Swiss mechanical watch industry was almost wiped out by an electronic threat called quartz technology, which instantly democratized accuracy in the form of cheap, Japanese-made watches. But ultimately, in the clash between soulless battery-operated machines and those handcrafted by human artisans, the mechanical watch won out, primarily because it militated the engineered anachronism of new technology. It endured, persevered, and grew more beautiful with age. Its electronic counterpart did not. A decade before, the craft of aerial warfare in the United States Armed Forces was almost eliminated because of a similar belief that new technology could think better and react faster than a human pilot. The F-4 Phantom II boasted state-of-the-art radar and sophisticated air-to-air missiles with electronic targeting systems that locked onto targets in milliseconds. It was decreed that the era of the conventional “dog fight” and the fighter pilot was over. So blind was the American military’s faith in the new technologies contained within the F-4 that the Navy decreed that planes be stripped of their guns, so as to carry greater ballistic payload. ult called for. And in 1969, Lieutenant Commander Dan “Yankee” Pederson, was asked to create and lead the new United States Navy Fighter Weapons School in Miramar, California. erson and fellow fighter pilot Captain Steve “Savage” Smith had only 60 days to set up the school to train pilots. Pilots selected to attend TOP GUN came from front-line units and were immersed in the religion of the dog fight, endlessly practicing and refining tactics with the expectation that the new dog-fighting skills they would bring back to their fellow pilots could mean the difference between victory and death. After four weeks of non-stop dog fighting, the pilots would emerge transformed, as if the controls of their planes were hardwired into their brains. But more than this, TOP GUN was a living testament to the superiority of the human mind, instinct and will over any electronic aid. In the ’80s, the eponymous Tom Cruise film, directed by Tony Scott, mythologized the hyper-competitive environment of “Fightertown, USA”. In 1996, NAS (Naval Air Station) Miramar, the home of TOP GUN since 1969, was transferred to the Marine Corps, and the Navy Fighter Weapons School was incorporated into the Naval Strike and Air Warfare Center in NAS Fallon in Nevada. Since it was founded in 1969, TOP GUN had never permitted its name to be associated with any watch brand until IWC’s CEO Georges Kern started to see the incredible synergies between the legendary fighter school in general as well as the pilots in particular and his timepieces. 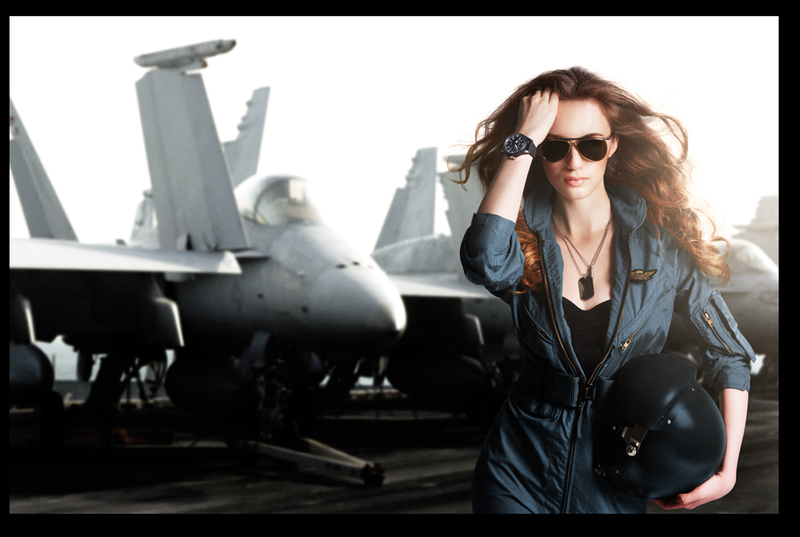 This year, IWC and TOP GUN deepen their collaboration with a family of TOP GUN watches destined to be the hottest commercial properties on the watch market. These amazing timepieces, decked out in ceramic cases and tactical straps, and ticking with some of the best in-house calibers in the watch industry, express a purposefulness that perfectly encapsulates the spirit of the elite pilots who train at the school. from the ground up, with pilots’ needs in mind. Movements were placed inside soft iron shields to render them impervious to the magnetic waves found inside the cockpit. Both watches boasted luminous hands and markers to read time in any condition; both featured a central seconds hand that could be hacked so as to synchronize the time; both featured bezels that retained the crystals even during sudden drops in pressure. However, many historians feel that IWC’s alliance with pilots dates even further back, to the iconic Mark IX watch. This watch was often purchased by pilots and converted for use in the cockpit. 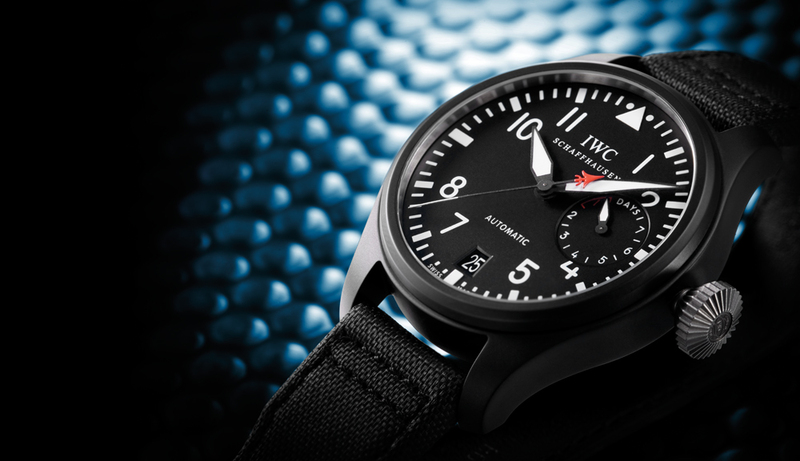 The stunning looks of this watch, combined with its unique rotating bezel and rarity (around 400 watches were made) make it one of the key cornerstones upon which IWC’s pilot’s timepieces’ reputation for performance was built. Visual references and performance characteristics for all of these famous timepieces are alive and well in the full range of IWC’s 2012 pilot’s watches. 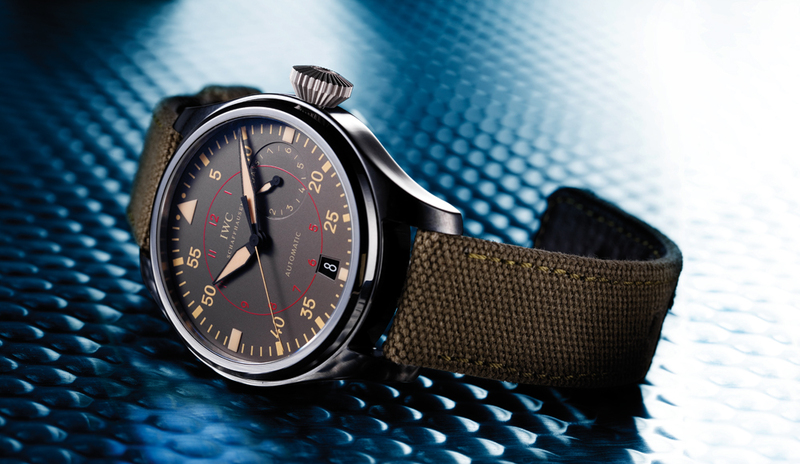 The latest IWC Big Pilot pays tribute to NAS (Naval Air Station) Miramar — the birthplace of the Navy’s Fighter Weapons School, known as TOP GUN. To many aviators, the name “Miramar”, or as it is affectionately known, “Fightertown, USA”, conjures up innumerable acts of valor and skill. TOP GUN was created in 1969 and remained at Miramar until 1996, when the station was passed on to the 3rd Marine Aircraft Wing. The Big Pilot is similarly the stuff of legends; the oversized case and dial provided unparalleled legibility, while the uniquely shaped large crown could be operated by pilots even with gloves on. For the first time ever, the Big Pilot is now offered in a zirconium-oxide ceramic case. Pioneered by IWC, zirconium oxide is one of the hardest substances on earth, with a Vickers rating second only to diamond, making it the ideal material for a hard-use watchcase. In addition, its stealthy anthracite gray color is totally anti-reflective. A slight 2mm increase in diameter from the steel Big Pilot makes this watch an imposing 48mm, but the innate lightness of ceramic makes it extremely wearable. An appealing counterpoint to the modern case material is a vintage deck-watch inspired dial, divided into an outer chapter ring for minutes and an inner red ring for the hours. All hands are finished in antique beige to further express this timepieces military bearing. Inside, the TOP GUN Miramar is powered by IWC’s legendary 51111 movement — not only one of the largest automatic movements in the world, but also one of it’s most efficient winding. Like the Big Pilot’s Watch TOP GUN Miramar, this heroic timepiece is distinguished by its slate-gray dial, vintage beige hands and minute chapter ring, as well as its red inner hour ring. In addition to the titanium crown, you’ll find two titanium chronograph pushers. Depress the one at two o’clock to set the sweep seconds hand and minute counter at 12 o’clock into action. The big news with this watch is that beyond its mighty 46mm ceramic case and stunning visual pyrotechnics, inside beats the all-new in-house caliber 89365, a derivation of the caliber 89360 first introduced in the brand’s Da Vinci Chronograph. This new movement is made distinct with a more traditional elapsed minute counter at 12 o’clock (the caliber 83960 features an hour and minute counter in this location), as well as the date aperture, relocated to three o’clock. This date display is styled to resemble a cockpit altimeter. The watch retains the 68-hour power reserve, as well as the fantastically practical flyback function of the earlier movement — where timing can be stopped and restarted with a single depression of the pusher at two o’clock. It also features a soft iron inner case to protect the movement from magnetism. As with all Miramar watches, this chronograph is fitted with a green textile strap reminiscent of the cockpit harnesses within the US Navy’s F/A-18E/F Super Hornet. While there have been several limited-edition executions of the Big Pilot Perpetual Calendar before, most notably in platinum for Singaporean retailer Sincere Watch, this is the first time this model has been executed with a ceramic case. The result is not only the most handsome Big Pilot Perpetual Calendar to date, but also the most comfortable, due to ceramic’s light weight. For any serious IWC collectors, this watch is simply a must-have, as it marries three of IWC’s iconic achievements. The first is the creation of the luxury watch world’s first ceramic cases; the second is the introduction of the legendary caliber 5000 (here it is known as the 51614) with a Pellaton winding system, and the third is the creation of IWC former technical director Kurt Klaus’ incredible perpetual calendar module — the world’s first fully synchronized perpetual calendar. IWC’s reputation for market-leading innovation in case technology was established in the ’70s, when IWC experimented with aluminum before creating the world’s first Swiss luxury watches with titanium cases for Porsche Design. To achieve this, the IWC team examined the hot forging technique used to fabricate the case blanks and augmented it using sintered steel forms. Another major hurdle was that during drilling, milling and lathing, titanium dust could ignite. So IWC found a special cooling liquid and combined it with reduced drill speeds. IWC not only managed to overcome all these hurdles, it also became the first company to successfully polish titanium. In the ’80s, IWC created another world-first by creating luxury watchcases from zirconium-oxide ceramic. Between 1994 and 1999, it created its first pilot’s watches from ceramic: the Ceramic Flieger Chronograph. Unlike ceramic cases, which are cast, IWC’s cases are first made with raw ceramic materials held together with a binder. These pre-blanks are fired, and the binder evaporates. The remaining pre-blanks are then machined to cut out a blank. The blanks go into a kiln and are fired at super-high temperatures where micro-grains are cooked together, resulting in a compact but very hard substance known as zirconium oxide. These blanks are cooled, during which time they shrink. The amount they shrink must be pre-calculated. Only then is the case blank ready for milling, drilling and threading. Because of the enormous amount of work related to fabricated ceramic cases, they add significant dollar value to the cost of a watch. The caliber 5000 first made its appearance in the Portuguese 2000 limited series of IWC watches before finding a home in the Big Pilot case. It boasted an 8.5-day power reserve, though it was automatically stopped at seven days to maintain a constant torque curve, as well as a system for bi-directional winding invented by former IWC technical director Albert Pellaton. First presented in 1985, Kurt Klaus’ perpetual calendar was a revelation to watch enthusiasts who detested the fussiness related to the various correctors needed to set the day, date, month and year of a perpetual calendar. Klaus’ solution was simple: he synchronized all information such that you could correct it as easily as advancing a quickset date. In addition, he came up with what was at the time the world’s most accurate moonphase display, as well as the world’s first four-digit year indicator. That the new Big Pilot’s Watch Perpetual Calendar is a combination of all three of IWC’s signature achievements (actually four, if you include the use of titanium for the crown) makes it an absolute necessity on the wrist of any serious fan of technical watchmaking. As with many icons, the Big Pilot was born out of necessity. Its design blueprint expresses the desire to fulfill the pragmatic needs of pilots and navigators alike. Its visual identity bristles with purposefulness. Its case was matte steel. Its dial was jet black with bright luminous indexes crowned with the immediately identifiable triangle with two dots at 12 o’clock. The extra large crown facilitated ease in setting. Even its famous strap, fitted with four imposing rivets, expressed the prevailing ethos of function over form. Approximately 1,200 B-Uhren watches fitted with the famous IWC pocket watch movement, the 19 lines caliber 52 S.C. (central seconds), were created and were used by German pilots and British deck officers alike. These watches are today some of the most collectable military watches on earth, and have captured the imagination of style innovators such as Ralph Lauren who has been pictured wearing one over the sleeve of his leather jacket when riding his motorcycle. Introduced in 2004 in a more conventional 46mm (versus the 52 S.C.’s 55mm), the contemporary Big Pilot rapidly became one of IWC’s most desired models, and was adopted by celebrities such as Quentin Tarantino, Jason Statham, Jude Law and even Arnold Schwarzenegger as their timepiece of choice. Such is the cult of devotion for the Big Pilot that the pre-facelift model from 2004–2006 is today trading for a significant premium on the second-hand and auction markets. 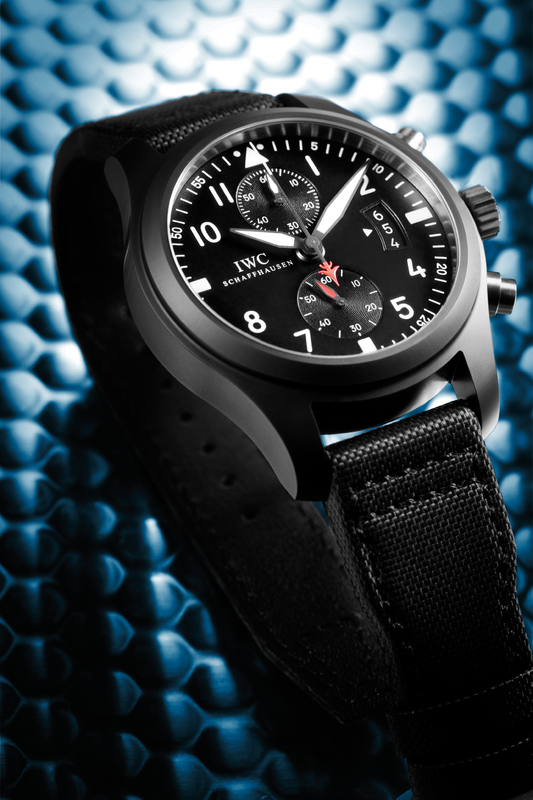 This year, the Big Pilot’s Watch TOP GUN forges an alliance between IWC’s legendary past and its dynamic future, bringing to the unmistakable iconography of the Big Pilot a new ceramic case with titanium crown, as well as the subtle addition of the a red aircraft silhouette counterpoised on the watch’s immense seconds hand. This detail was first seen in the ceramic double chronograph TOP GUN from 2006 — the very first timepiece born out of the collaboration between IWC and the Navy Fighter Weapons School. Inside the watch is the caliber 51111, featuring the ingenious bi-directional pawl winding system known as the Pellaton. This system differs from automatic-winding systems found in other watches in that it places the massive automatic rotor on a sprung plate, providing it with shock resistance. The movement of the rotor activates a cam, which transmits this energy to a wheel using two pawls. The result is highly efficient winding capable of building up to a full seven-day power reserve in just 1,960 revolutions of the rotor. 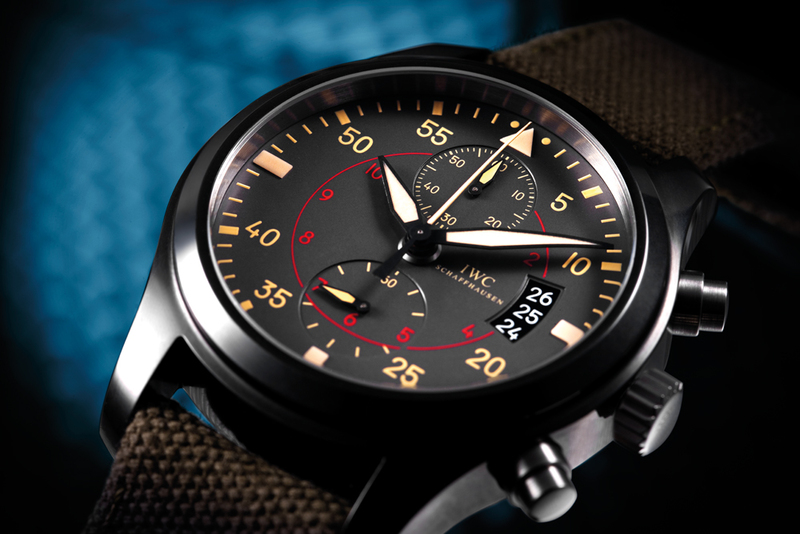 While IWC has made ceramic-cased pilot (or “flieger”) chronographs since 1994, what is notable about the new Chronograph TOP GUN is that it is the first of these to contain a fully in-house-developed chronograph caliber.The Caliber 89365, first created for the Da Vinci Chronograph, was conceptualized by IWC’s technical director Stefan Ihnen, who selected a column-wheel-activated oscillating-pinion design for maximum reliability. The movement oscillates at 4Hz — precisely the optimal speed for a chronograph, allowing divisions of time to an eighth of a second. This caliber also featured some remarkable innovations, including a spring-loaded arm on which the rotor is mounted, as well as Ihnen’s variation of the Pellaton winding system, now incorporating four, as opposed to two, pawls to increase winding efficiency by 30 percent. to send the minute and seconds hand back to zero and immediately restart a new timing. The case of the watch is an imposing 46mm. 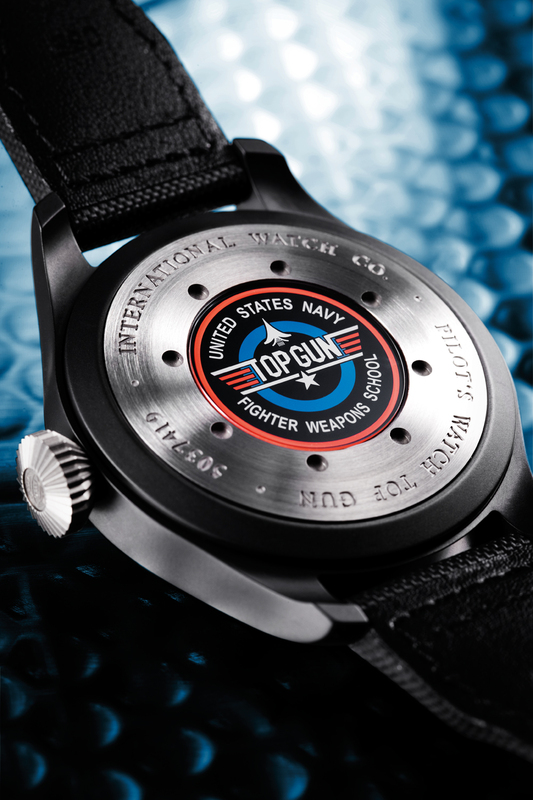 It is crafted from zirconium-oxide ceramic and fitted with a textile strap to complete the military theme.